Podcast Episode 110 — Finished? More Like Ruined! 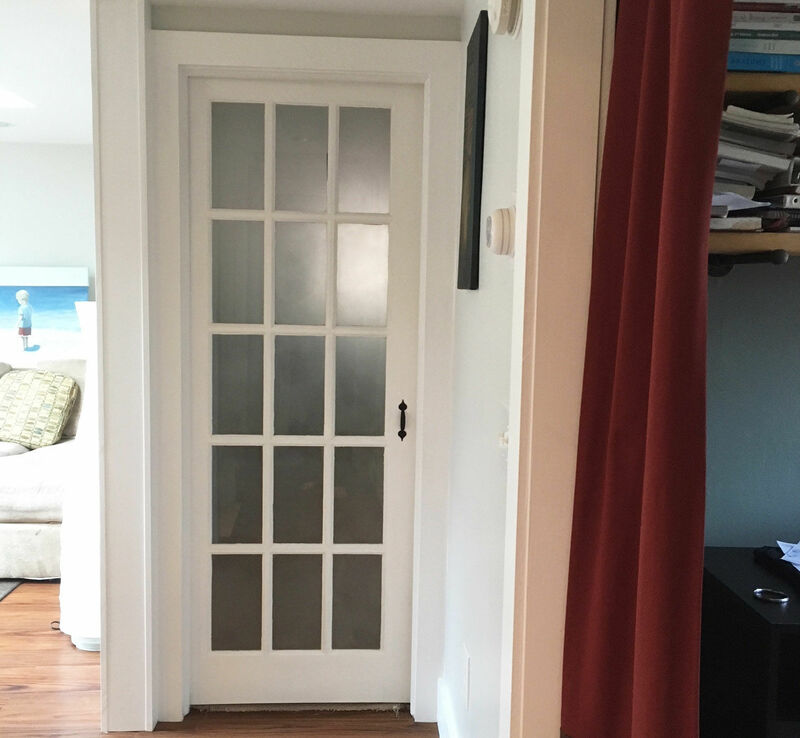 Finishes and coatings: frosted glass, milk paint, wood stain, and sprayers. Also, plywood, net-zero and building codes, building a desk, and hidden joinery. In this episode, our clock is broken, but we’re trying to stay on time anyway. 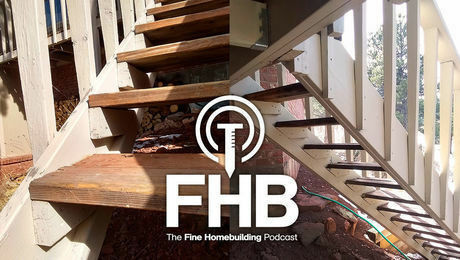 Fine Homebuilding magazine editor Justin Fink is joined by editorial director Rob Yagid and design editor Brian Pontolilo. Brian wants to talk about his divided light French door — that’s it, above, after frosting. He has one in his bedroom that opens on his living space. There was a shade on the back of the door for privacy, but he decided to frost the glass instead. 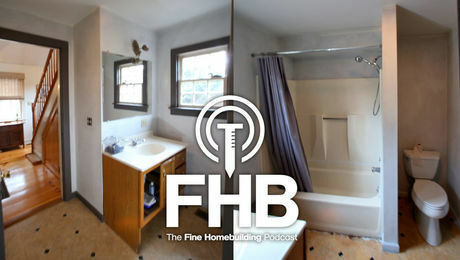 The guys talk about alternatives, such as films and sprays that frost the glass — Brian used a spray product on his job. Justin compares and contrasts with milk paint. And that reminds Rob of a bathroom vanity Justin made and painted with milk paint. Links on that are below, so scroll way down please. Continuing to chat about coatings and finishes, Brian has more to say about finishing his stained pine kitchen cabinet project. And Rob is interested in cordless and corded sprayers. I’m all on board with the idea that people SHOULD go as far as they can toward reaching the goals of green building best-practices. We are looking to buy a home in the next few months here in California and will seek to make any modifications we can toward that goal. I am completely opposed to making it a code requirement though. First, justifying it based on the argument that it’s about “safety” is an absurd expansion of what building codes should be about. Building codes set a minimum standard of safety – defined as “the building isn’t going to fall down on me, I can get out if there’s a fire, I shouldn’t have sewage in my potable water” – they shouldn’t be there to set the standard for best practices. If you can justify net-zero with a safety argument, why not make the WUI standards a requirement across the state? or fire sprinklers? Also, for someone buying a home today, they can count on their mortgage consuming anywhere from 35% to 50% or more of their monthly income. Adding PV arrays, battery back-up, slightly more expensive wall assemblies, etc adds to the upfront cost, and arguing otherwise defies logic. So, there are plenty of arguments to be made that people SHOULD demand and buy a net zero home. Heck, we would buy one IF WE COULD AFFORD IT. But why should all of this be a code requirement? Are typical code-built homes as good as they could be? Of course not. But I think you’d have a hard time convincing most people that they aren’t safe. Justin thinks Josh has a good point, that codes have traditionally been about about basic safety, not energy efficiency … incentivized, yes; required, maybe not. Brian points out that some issues are local or regional (fire sprinklers), while other issues have wide effects, even globally (net zero). Energy efficiency is necessary everywhere. Safety is not just structural; it is linked to everything else in our world, says Brian. Rob draws a comparison to cars, with fuel efficiency and emissions standards. He thinks that modifying the way we build houses to make better use of our resources is a reasonable expansion of the code. Rob worries about the economic argument too, though; banks and financing have not yet caught up with these costs. The guys also discuss how, in this age of water shortages and droughts, home water management may well be going the same way that energy management has evolved. Trivia, also thanks to Josh: Pronouncing state names: NevAda or NevAHda. 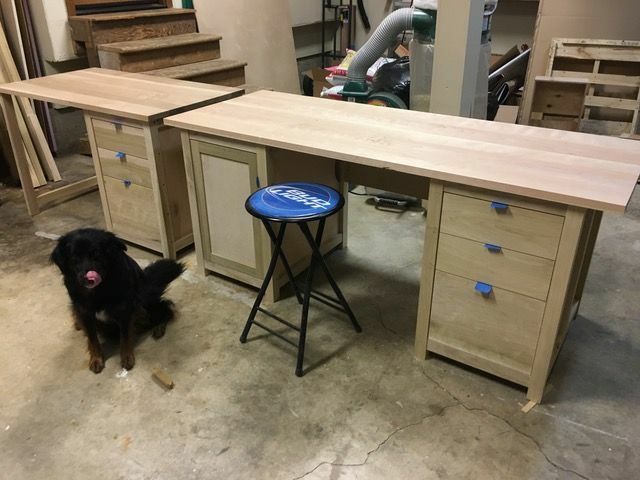 I’m wrapping up two desks with drawer cabinets, and the style is based on Justin’s FHB bathroom vanity build, and FWW’s “Build a Computer Desk.” I liked Justin’s simple shaker style, but I went my own way on the cabinet construction technique. 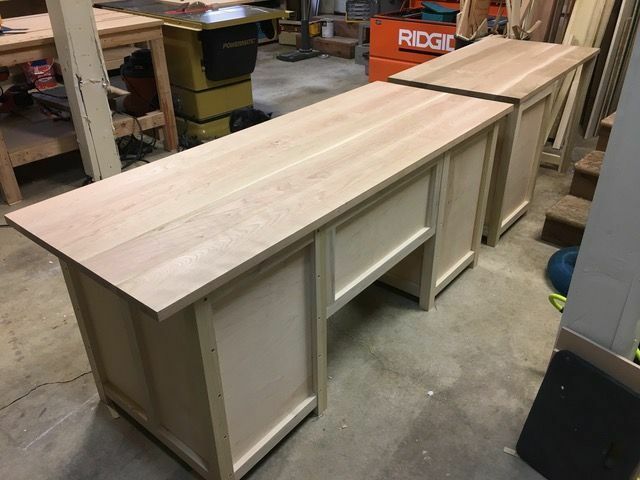 I glued/screwed notched, full-length legs to a biscuit-joined 3/4” plywood box, and then essentially “trimmed” out the plywood box to give it a rail/stile look without all the rail/stile fuss. 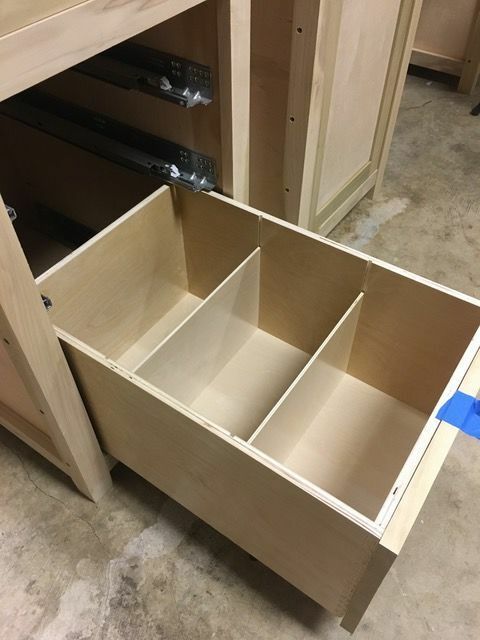 To me this type of cabinet construction makes a lot of sense: super strong, efficient to build and keep square, and the drawer hardware attaches easily … at first I thought this was all my own idea but then yesterday I realized BRIAN built his kitchen cabinets this same way back in episode 44. And I apparently subconsciously copied him. My question is why aren’t more drawer cabinets / vanities / built-ins etc built like this? How Tim’s vanity was built. How the Fine Woodworking desk was built. AND check out the gallery of photos from Tim — Scroll down and click! 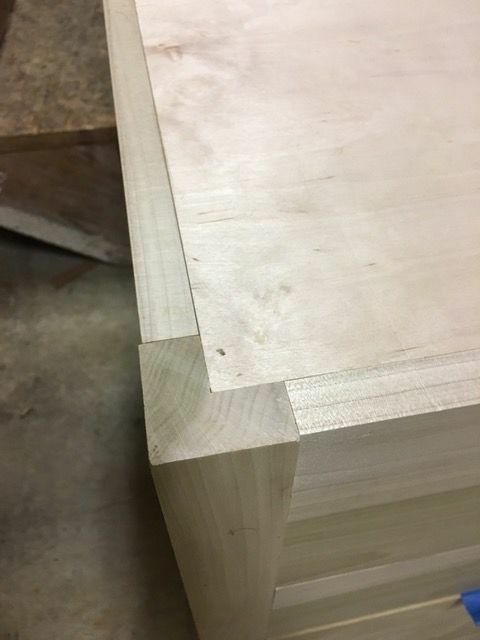 Gentlemen, when it comes to hidden joinery, what are your thoughts on biscuits, dominos, and pocket screws? Do you have a favorite, or use all three? The guys discuss the pros and cons. Everyone can paint. This is true. But not everyone can get the project done right. And Benjamin Moore knows that’s why you’re on the job. You’re more than a paintbrush and a ladder. Your client can buy those things at a hardware store, but they hired you for your skills and expertise. You know every paint job is different and that it takes more than one coat for the best finish. Benjamin Moore believes in doing things the right way. Because everyone can paint, but to do it right, it takes an expert contractor, it takes more than one coat and it takes Benjamin Moore. Paint like no other. Justin’s Build Your Own Bathroom Vanity article (finished with milk paint, for members only). Bathroom Vanity Slideshow (goes with the above article, but open to anybody, even non-members). Don’t Be Afraid to Spray. 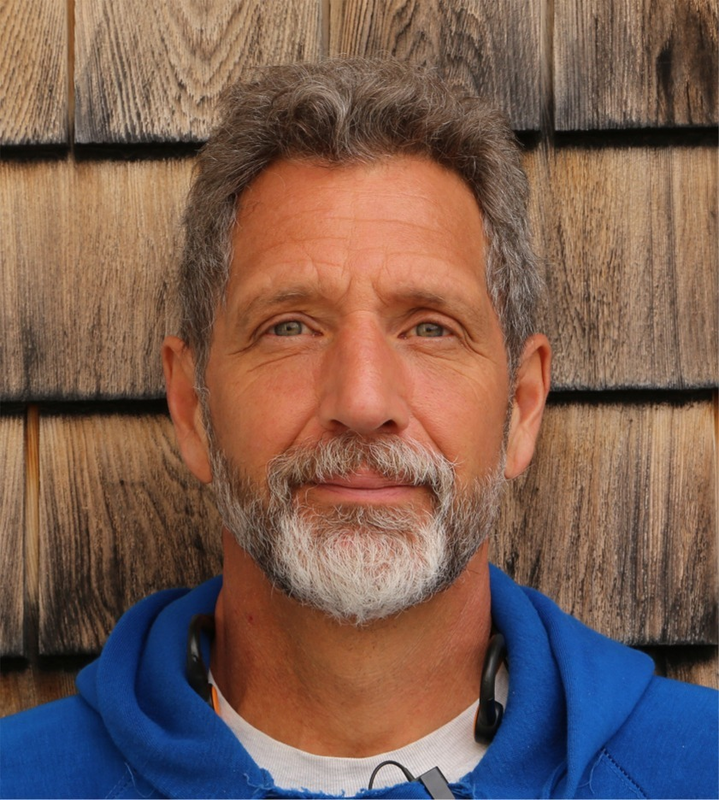 Rob’s article on Bringing the Water Shortage Home. Fine Woodworking’s Joinery Shootout (FWW members only). Readers Respond to the Joinery Shoot Out (for non-members). 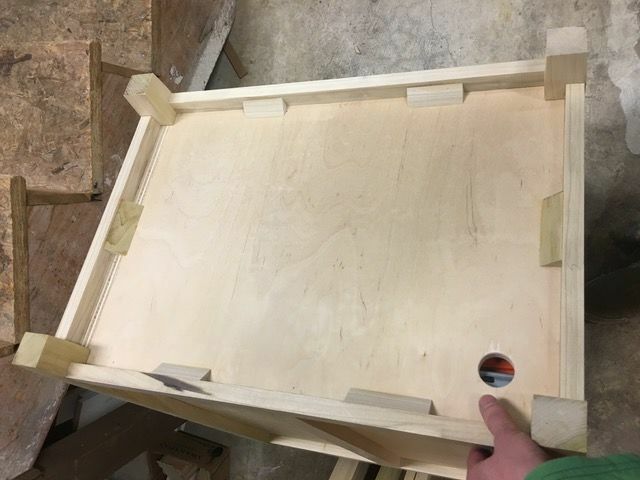 Please also click the Launch Gallery button below to see the photos of Tim’s desk project. Efficiency depends upon occupant behavior. After all is a 1965 Mustang driven 5 miles a week any more polluting than a 2018 Toyota corolla driven 100 miles a day. The answer is an emphatic no. This is why it's difficult to assign a value for energy efficient upgrades to a new single family dwelling. In any case California has a fairly mild/dry climate so "zero energy" is easy to hit with a PV array. It's much more difficult to reach that standard in mixed-humid, and extreme cold climate zones. Pocket screws without glue on face frames are far more apt to rotate when carrying/moving. I have unloaded thousands upon thousands of cabinets, and lower grade cabinets that only relay on pocket screws only (no glue) undoubtedly are a weaker connection. CA as a state is within their rights to make any code requirement they want. Codes have embraced many things that are beyond their primary goals of health and safety. Central heating, insulation, air tightness, minimum room size and dimension. So extending building codes to require new homes be required to be zero energy is not outside what codes are already regulating. Codes are developed and ammended with input from any interested person or group at the model-code development level (national) and the local (state, county, city, town) level. 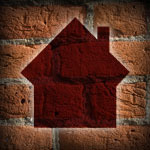 So anyone who opposes or promotes new elements to building codes can give their input. And when new code provisions enter a code and end up being opposed after implementation, they can be recinded and changed - at the model level and local level. So if you oppose a code change - speak up. If you support a code change - speak up. I appreciate you guys taking some time to talk about my email, great discussion. I agree with most of what Brian said about why net zero, just not the mandatory part. As for Mike's comment below, I agree the state can impose the requirement. But my point was that they shouldn't.